High-technology is an integral part of Oregon’s economy. It accounts for roughly 5% of statewide employment but a considerably higher share of overall wages. The sector’s average wage is more than twice the statewide average, $103,900 in tech compared to $48,300 for all industries. The sector is particularly productive and drives much of the state GDP figures, which is measured on a value-added basis. When you start with essentially raw materials and end with a semiconductor, the value-added over that process is huge. As I was updating our office’s high-tech work, the news broke that Intel, Oregon’s largest private employer, will be laying off some 12,000 workers overall. We do not know the local impact yet, but it is important to keep a few things in mind. 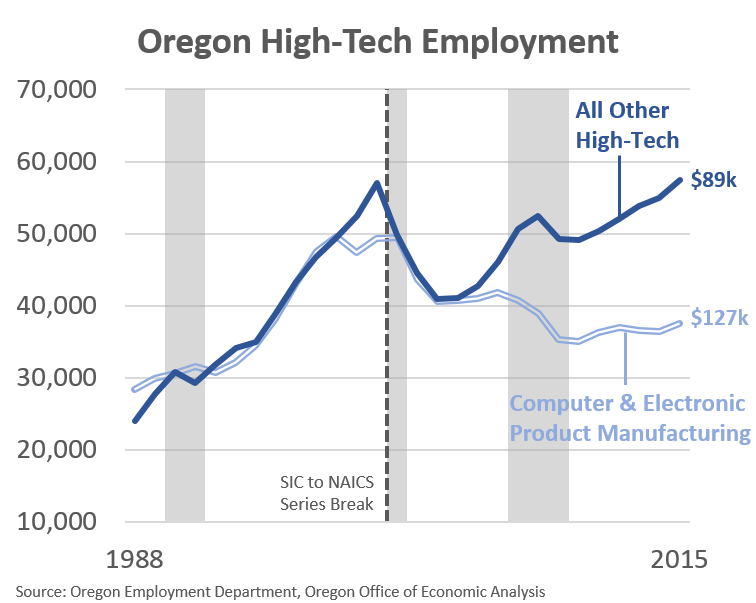 First, Oregon’s tech legacy and comparative advantage is on the hardware side. However this is no longer an employment growth sector. It has not added jobs since the technology bust back in the early 2000s. Specifically, our office’s outlook for computer and electronic product manufacturing was no job growth over the next decade. That was our outlook before the recent announcement. We did, however, expect the number of these highly-productive, well-paying jobs to be stable moving forward, albeit with no further growth. Second, we still do not know the local impact of the losses. When we do we will discuss with our advisory groups and adjust our forecast accordingly. No doubt, the losses will hurt and be felt in the regional economy. However, in a way, now is a good time for terrible news. The economic winds are at our back. The state is adding 4-5,000 jobs per months in recent years and the Portland MSA (including Vancouver) is adding 3,000 jobs per month. The economy is as strong as it has been at any point in the past 15 years, both statewide and in the Portland Metro. These gains will help ease the pain. Third, over the years, being a major hub of the semiconductor industry has served the state and regional economy very well. While employment trends are flat to down locally, the rest of the country has seen losses 2-3 times as large. The hub generally outperforms the spokes. Fourth, all of the high-tech growth in the past decade is on the software side of the industry. Most of these gains are in Multnomah County and many are associated with outposts for companies headquartered elsewhere, such as the Bay Area. This is one reason our office has some concerns about the recent software growth. Given the hardware experience over the past couple of decades, being the spoke or outpost, does increase potential losses during the next downturn or technology cycle. 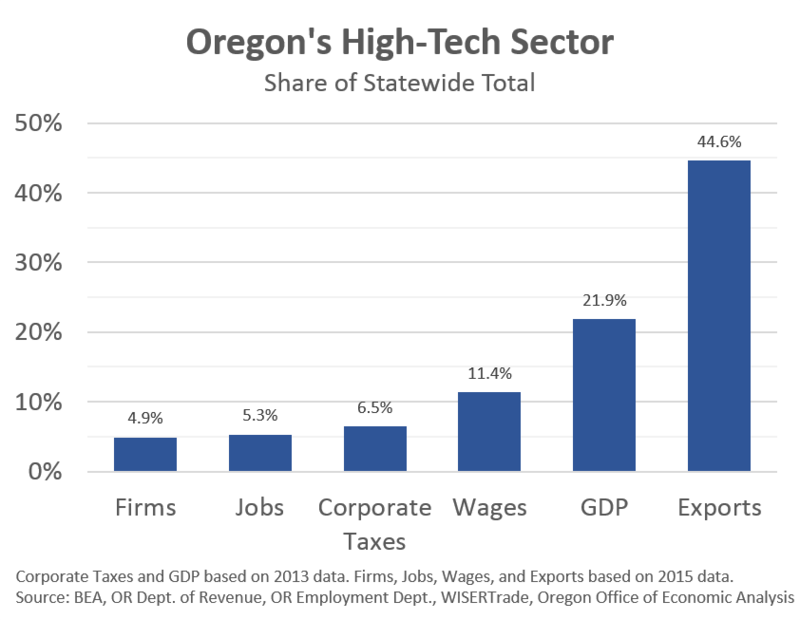 Overall, high-tech is a growing and important sector in Oregon’s economy. It provides nearly 100,000 very well-paying jobs. So far the industry is successfully diversifying from our historical strength in hardware manufacturing to software. While risks remain to any industry outlook, the tech sector gains have been very encouraging. Finally, a full set of slides are below for those interested.